we can see one or maybe both of Mars moons. I'll get out the 600 mm lens at least and maybe one of you can get out your big scopes and get a good image. First, I should post a reference from Still into Power Control Systems, Expert, Gene, who found a geology video. Now geology, like astronomy, looks back in the past too and can describe what the Earth looked like millions of years ago and even predict the course of the continents millions of years into the future. I guess if our scopes keep getting clouded out, we can look at the ground and take up amateur geology too. Check out the video. Thanks Gene. We did manage to get out to Beaumont in the inland empire for a high school graduation ceremony, and wow they do have dark skies out there even with the city lights. To bad we needed to drive 2 hours through Corona/Riverside construction traffic to get there. 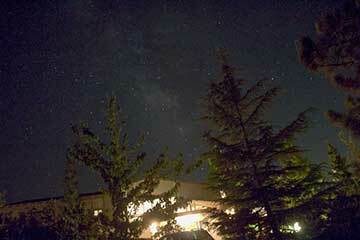 So, I was surprised by how bright and big the stars were and I managed to snap the attached photo with my IPhone. See attached. Hey, wait a minute, my star image was photo bombed by two good looking graduates! Ok, ok, those are not stars, it's just stadium lighting. The photo shows Just Graduated, "Great-niece", Off to Journalism school, Kendra and Just Graduated, Off to Chemistry/Premed school, Melissa. Congratulations Kendra and Melissa! Have high school girls always been so cute? I don't remember that during my high school years. Well, I probably was so busy looking at my slide rule that I wouldn't have noticed a girl if I tripped over one. Anyway, years later I looked up and found a girl who became Resident Astronomer, Peggy. Thank you Peggy! At the ceremony, I talked with Graduated Last Year and Aspiring Musician, Kody, who had asked about the fourth dimension and what that would be like. Well, when I was in high school the fourth dimension was the plot of a movie, titled, if I remember correctly, "the 4-D Man". It was about a man, who became a monster, of course, after he discovered how to travel through walls and such by traveling through the fourth dimension. Have I remembered it correctly? Any of you old folks remember that movie? There are many wild ideas out there about 4-D, but as I'm learning now, in my quest as a physicist wannabe, to understand modern physics and cosmology, that the use of 4-D is perhaps the most significant and fundamental way of describing the laws of physics. Yes, today 4-D is composed of the normal 3-D dimensions we are used to in the work around us, plus time as the fourth dimension. Modern laws of physics are developed in 4-D format because only by including all four dimensions can laws of physics be written so that the laws are independent of how fast the observer is moving. The same laws apply regardless of how fast the observer is moving. Each observer will observe and measure different values for some terms, but doing the computing in 4-D results in the same, as physicists say, invariant, value. This is the central theme invented by Einstein in both the special and general theory of relativity. So physics laws once written in 4-D format will and can apply to everyone, Klingons or Khardasians, and of course the rest of us. Ok, ok, enough for now. Let's all get out and get some images of Mars.